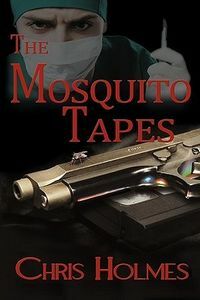 The Mosquito Tapes by Chris Holmes: Synopsis and Online Purchase Options. Synopsis (from the publisher): Jack Youngblood is a ghoul. That's what his friends call him. More comfortable in the morgue than the coffee shop, Jack is San Diego's Chief Medical Examiner. Dead bodies are his business. A twice-divorced recovering alcoholic, Jack hasn't had a date since he's been sober. His only commitment is to his work; his only love is Lilly the Lab who shares his home. When red-haired, green-eyed Jill Hanraty, a Forensic Investigator, joins his department, Jack falls for her like a mountain climber losing his grip. Together they investigate a pair of baffling homicides. Jill becomes more than Jack's colleague — more than a friend. Until she betrays him. Part love story, part forensic police procedural, this fast-paced novel is full of chases, plot twists, a dramatic climax, and an on-again, off-again romance as mysterious as the murder investigations themselves.